Avery never imagined being on a triathlon team or racing in a 5K. A single mother, she never thought she would have time for training, or that she would be coached by former world champions. All she hoped for was to be able to swim a mile to honor the memory of her late brother. She started 2018 with swimming laps on her own, and soon discovered that she was welcomed to swim with the triathlon team. One lap in a 50 meter pool was a struggle at first, but in June of 2018, with her teammates cheering from the beach, she completed the Greenwich One Mile Open Water Swim. She was so encouraged by her swim and experience with Team Engine, she decided to become a full member of the team and soon joined the Friday morning track practices. At first, a 200 meter jog was enough, but she soon progressed to a one mile jog/walk. In September, Avery completed her first 5K run. In so doing, she became the epitome of what can be achieved with hard work, perseverance and courage. The Engine athlete with the biggest heart for her teammates and coaches, became the 2018 Athlete of the Year. Her next goal is to compete in her first triathlon. Brian is our veteran marathoner. 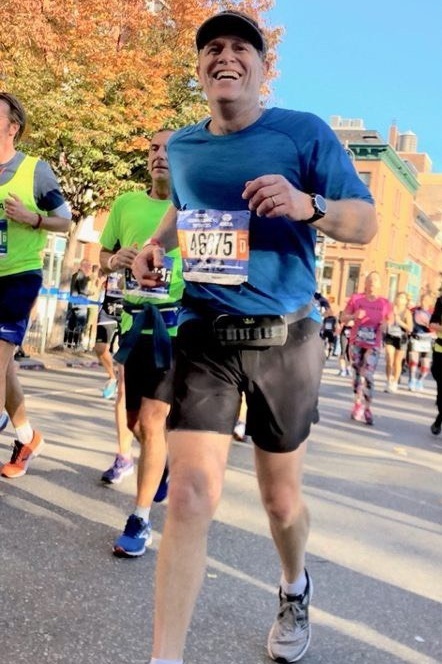 A finisher of several NYC Marathons and a founder of the Greenwich YMCA Run Club, Brian joined the triathlon team at its inception in February 2018 to augment his marathon training. At our first swim practice, Brian struggled to complete one length of the 50 meter pool. Less than a year later, he glides through a 3,000 meter swim practice. In 2018, he completed his best NYC Marathon. His goal in 2019 is to complete his first Sprint and Olympic distance triathlon. Chris is truly awesome. A veteran triathlete of a certain age, Chris is faster than most triathletes one-third his age. A member of the “old-guys” team (along with Raf), Chris loves to chase Jan and Steve (the young guys) around the track during practice. The fact that Jan and Steve may be passed by a 60 year-old strikes fear in their hearts, and makes them run a lot faster. Chris’s accomplishments in 2018 includes a second place age group finish at the Mighty Hamptons triathlon. He is a 2019 USAT Age Group Nationals Qualifier. Diane is an experienced triathlete having competed at the Sprint, Olympic and Half Ironman distances. A former member of a local tri club, Diane loves to assist other triathletes in achieving their goals. After recovering from injuries, Diane returns to racing in 2019 at the NYC Triathlon, her first Grand Fondo in the spring and her first marathon in the fall. Hamid is one of the enthusiastic leaders of the Greenwich YMCA Run Club. He loves to run, he loves to race, and he loves to train…and he always starts too fast. Do you need a running partner? Hamid is your man. So when the crazy idea of starting a triathlon team with world-class training sprouted, we knew that we would eventually land a very enthusiastic team member in Hamid. To say that he loves the triathlon team and our coaches is an understatement. In 2018, Hamid achieved several top finishes at various distances in running races throughout the Northeast, but perhaps his greatest accomplishment, with the help of his triathlon teammates, was overcoming his fear of open water swimming after a near death experience in his college years. His goal in 2019 is to complete his first Sprint and Olympic distance triathlon (and not start out too fast). But perhaps the greatest accomplishment was coaching his wife to complete her first Sprint distance triathlon! Training and racing with Mary is a lot of fun, and she is a great teammate. 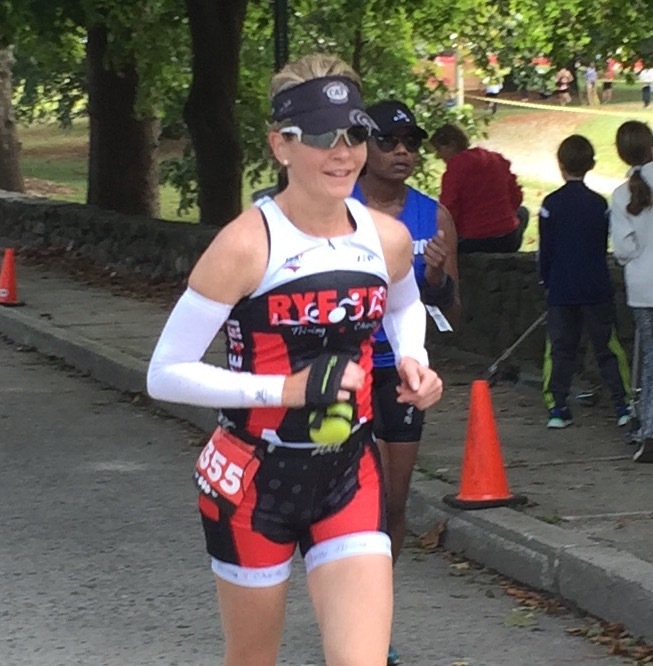 An accomplished runner, Mary has completed the NYC Marathon three times, the Greenwich Half Marathon four times, and other significant races throughout Fairfield County, CT. As a new triathlete, Mary overcame her fear of open water swimming and completed her first two Sprint distance triathlons in 2018, and her goal in 2019 is to jump up to the Half Ironman distance. We feel confident that she will achieve her goal, because when it comes to triathlon, there’s nothing she can’t do, except maybe pick out a wetsuit that fits properly. “Rocky”, “Rafa”, “The General” leads the team in nicknames. Raf’s journey to the triathlon is miraculous. A former high school and college wrestler, Raf started running during college to stay in shape. He has completed over 100 road races (from 5K to Marathons) including the 1986 NYC Marathon, all with a 1 ½ inch leg length difference due to a hockey injury in middle school. A series of miraculous events led Raf to undergo limb-lengthening surgery in 2014 and 2015 under the care of Dr. Austin Fragomon, at the Hospital for Special Surgery. Unable to run during his recovery from surgery, Rafa decided to take swimming lessons, and his instructor just happened to be a former college triathlete and NCAA swimmer. She made a bet with Raf that she could get him ready to complete his first Sprint triathlon in eight weeks (he didn’t think it was possible, because he couldn’t swim). In 2016, he completed his first Sprint distance triathlon – the KIC IT triathlon in Stamford CT. In 2017, Raf was named “Runner of the Year” by the Greenwich YMCA Running Club. In 2018, he became one of the founding members of the Engine Triathlon Team, with one goal in mind – to complete his first Olympic distance triathlon. 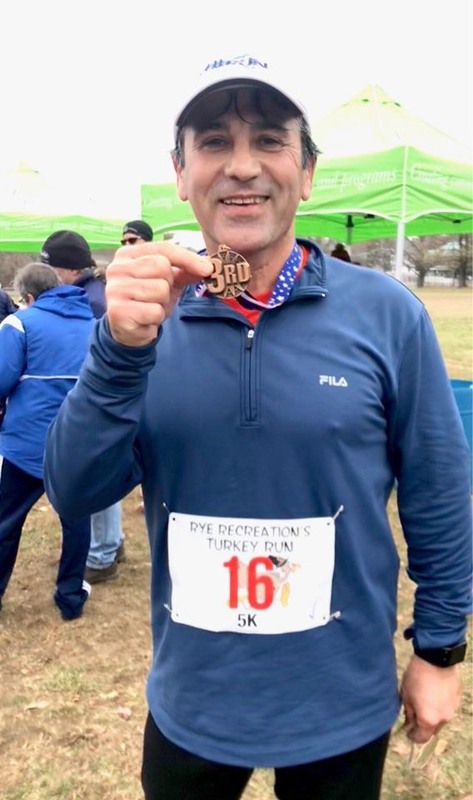 With coaching from Engine and the support of his teammates, Rocky completed a goal that he set 30 years ago – in 2018 he completed the Mighty Hamptons Olympic Distance Triathlon. During his rehab from surgery, therapists could not explain some of the balance, spasticity, leg weakness and foot drop issues that did not improve. A brain MRI in 2017 discovered brain lesions; and in 2018, Raf was diagnosed with Cerebral Palsy, a condition that had been undiagnosed since birth. With gentle(?) prompting from Cassie and Spencer, Rafa’s triathlon goal for 2019 is to qualify for the U.S. Paraolympic Nationals and ITU Challenge Nationals; and eventually, to compete at the World Championships. An avid runner, Randy is also a virtuoso performer in the piano and organ. A much sought after performer in the classics, pop and the sacred repertoire, he graduated from The Juilliard School where he became the only student in the history of Juilliard ever allowed to pursue and receive simultaneous degrees in piano and organ performance. Randy has performed at Alice Tully Hall and made his Carnegie Hall debut in 1991. He has recorded 16 albums featuring classical music as well as his unique arrangements of sacred music as featured on “Amazing Grace”. His heavy concert schedule has taken him around the world, including 17 performances in Paris at the American Embassy. He has had the honor to perform for the former First Lady Laura Bush, President Bush and President Obama. He has performed for such artists as Mick Jagger, Kathie Lee Gifford, Phil Collins, James Taylor and Diana Ross. Randy has run the New York City Marathon, completed his first indoor triathlon and is currently training with Engine for his first Sprint. Perhaps his greatest accomplishment while training with the team, was overcoming his fear of drowning – a fear he has had since his youth, as a result of a near death experience. Please ask him to tell you about that experience. It is a wonderful story of hope that will encourage you. Every team has one. The unassuming athlete that walks around with a big smile, constantly encouraging everyone else. He doesn’t look like much of an athlete himself. While everyone else has the latest high-tech training gear, he looks very unassuming in baggie surfing shorts (not racing Speedo swim suits), scuba mask (not racing googles for swimming), and definitely no cycling racing shoes – just sneakers, please. But when he gets in the water, on the bike or on the track – he blows you away. His reason for racing in a triathlon race is to finish early so he can cheer on his teammates as they cross the finish line after him. To say that we love Scotty, is an understatement. Scotty leads our Swim Across America team, and the event is one of the highlights of our racing year (but it’s not a race). Susie Q is a former Division I Track & Field and Cross Country runner from West Virginia University. She is a former USA Track & Field Masters Age Group champion in the indoor mile and indoor 800 meters. Several injuries and surgeries over the recent years kept her from training and competing. In August 2011, she had surgery to repair impingement of the right hip. In August 2012, she had surgery to repair her right hamstring after tearing two tendons off the bone. In March 2015, a plantar fascia release was performed and Haglunds deformity bone removed from her left foot. Several years of pain and weakness in her right hand, arm, neck, and shoulder led to spinal fusion surgery and discectomy in August 2017. After several roller coaster years of injury, physical therapy, surgery, more physical therapy and much inactivity, Susie needed direction, focus and motivation to get back in shape. She became the lone woman to join the Engine Triathlon team at its inception in February 2018. Since training with Cassie, Spencer and the guys, she has won her age group in several 5K road races and in the 2018 CT Master Games, she won in the 1500 meter, 800 meter, and 400 meter distances. In August 2018, one year after spinal surgery, she completed the Mossman Sprint Triathlon. 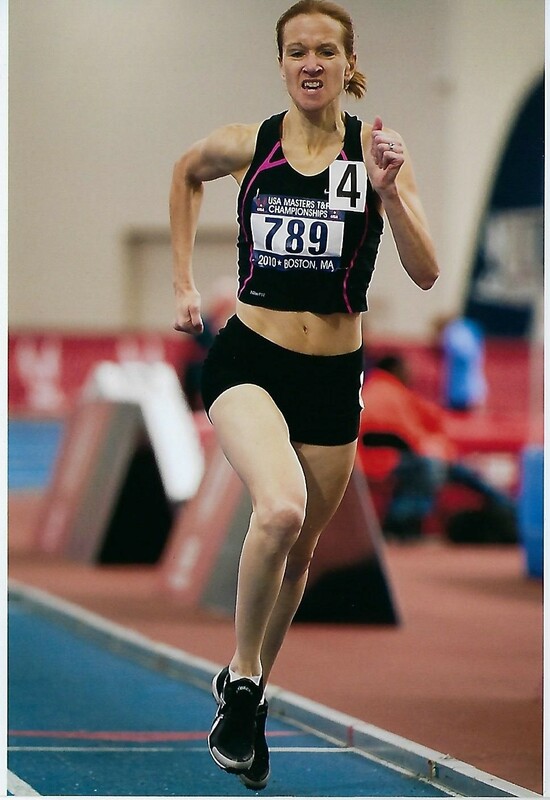 In January 2019, just shy of one year of training with Cassie and Spencer, she became champion in her age group in the 3000 meters and 800 meters at the USA Track & Field East Regional Masters Indoor Championships. That’s some “track” record! Toufic is an experienced Ironman triathlete. Injuries and other commitments led to his retirement from the sport in 2017. He remained active by periodically joining friends on group rides, but he missed the challenge of racing, and the camaraderie of a team. The news of a team led by world-class coaches intrigued him, and he joined Engine as a founding team member and after a few practices, the joy and excitement of the triathlon returned. Toufic is one of our most knowledgeable triathletes, and he generously shares his knowledge and enthusiasm with less experienced athletes. Our “third coach” leads our Saturday group rides for new triathletes. Perhaps his greatest achievement in 2018 was helping his teammates overcome their biggest fears in order for them to finish their first triathlon. Toufic’s goal for 2019 is to return to the Half Ironman and Ironman distances, and along the way, encourage his teammates to achieve their goals.